BERLIN - It was a sixth inning that was full of excitement. 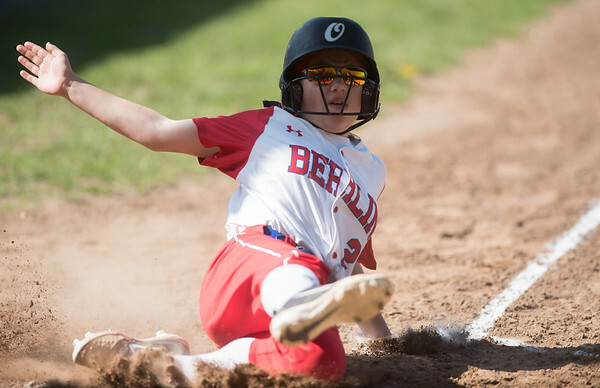 Lindsay Walsh launched a solo home run and Alexa Lanteri hit an RBI triple as the Berlin softball team scored five runs in the bottom of the inning to cap off their 9-0 shutout over Platt 9-0 Monday afternoon. Walsh finished the day going 3-for-4. Lanteri went 2-for-4. Although the Redcoats were struggling to adjust to Panthers pitcher Caitlyn Hart at times, they were still up 4-0 going into the bottom of the sixth inning. Hart gave up nine hits over her six innings, but out of her nine runs, only four were earned. Her counterpart, Stef Poulin, delivered another strong outing for the Redcoats, striking out eight batters over seven innings. She issued just two walks and only gave up one hit in the process. Hart gave Berlin a free base at the start of the inning when she hit Kelsei Zliczewski with a pitch. Zliczewski then stole second and third base and was brought home on Jenna Zup’s sacrifice fly. Following Walsh’s home run two batters later, Alexandria Gill’s error allowed Berlin’s Casey Urygra to reach second. Michelle Cohen singled to center field, but as Urygra was heading to third, Hart threw the ball out of play, allowing the Redcoats to advance to bring Urygra home. Lanteri then hit her RBI triple to center field to bring home Cohen. She then stole home as Zliczewski was in between pitches. “I think it was just getting down to the end and we wanted to finish it,” Lanteri said. “We really wanted to just dig down deep and come back,” Cohen added. Berlin scored its other four runs spread out over the other five innings - one in the first, two in the second and one in the fifth. Posted in New Britain Herald, Berlin on Monday, 14 May 2018 21:02. Updated: Monday, 14 May 2018 21:04.